Sharing Communities finished in October 2015 but please watch this video to get a flavour of the project! This project has evolved from Build a Bandstand into a parade of ‘The Wayfarers’ These portable stages are being designed and pre-fabricated by UWE Archtiect Students. The audience is invited to watch them being assembled on the Cumberland Piazza from midday and accompanied by The Ambling Band and some busy monkeys as part of the Portway Sunday Park. The idea of a bandstand was all about the communal performance space offered by bandstands world-wide and we have used this inspire the students, who are creating some splendid structures made from recycled materials, which will then be re-used yet again. The plan is to create vertical gardens on the Cumberland Piazza! 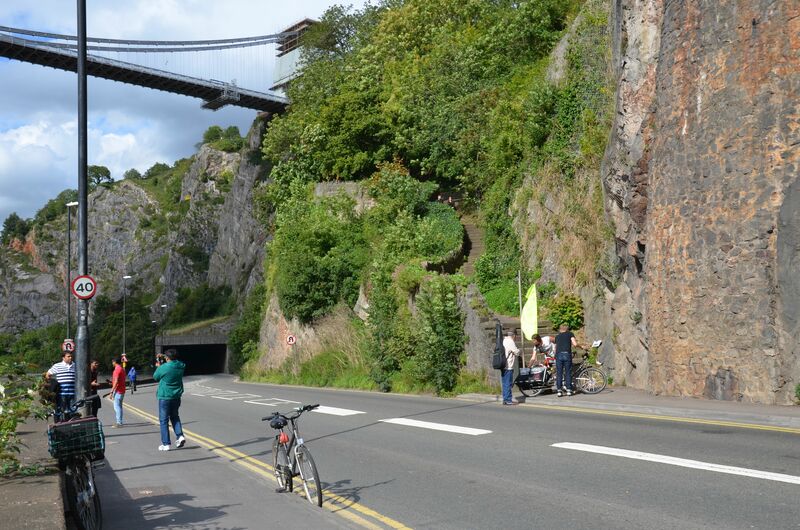 Being on the car-free Portway for previous road closures made me aware of the acoustics created by this amazing geological structure we have in our city and how ‘re-purposing’ the Portway as a performance space would be a fantastic thing to do. Luckily the Portway Sunday Park organisers agree and have organised other musicians and a carnival float too. 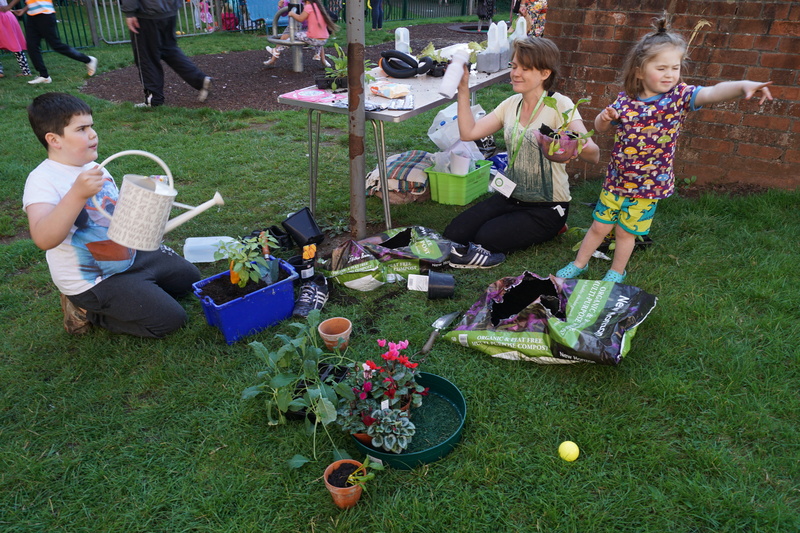 Cutting car emissions by extending normal Portway closures, even 5 times a year reduces pollution and making structures that have a fun, community purpose and can be turned into planters all add a little more oxygen to our city’s atmosphere. We have made about 60 boats from waste wood in the Underfall Boatyard with members of the public and had so many interesting conversations. 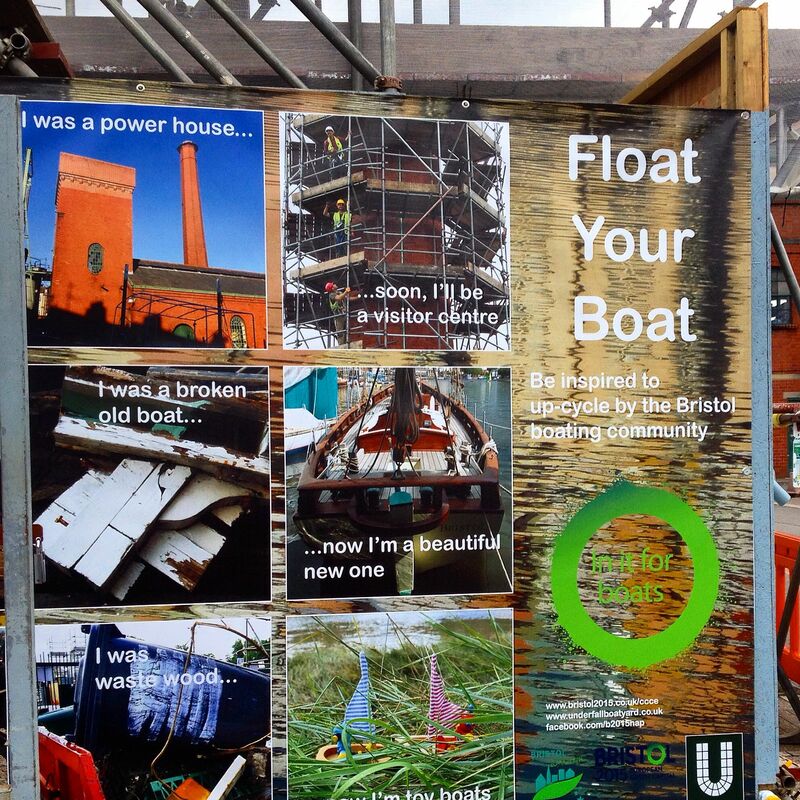 People have enjoyed the banner and our stories collected from the boating community. 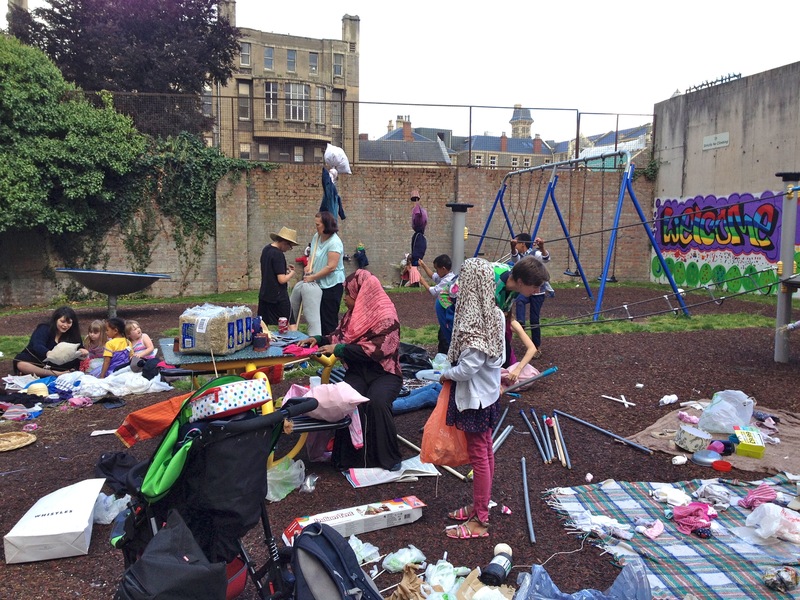 Encouraging people to create communal gardens out of waste space, we will be focusing on some land next to Francombe House in Redcliffe and working with the WUF Residents Association to improve their outdoor space. This year the residents wanted to add some ‘Green’ activities to their Children’s Day, so Louise Block did a ‘Stomp Rocket’ workshop using up old plastic bottles to make fun toys and Isobel Tarr, from Sims Hill Shared Harvest is going to make planters out of milk cartons, old shoes and other waste. The residents have organised more childrens’ entertainment and everyone is welcome to join in. We’re also showing everyone the planting plan and mural designs for the new food and pollinators garden we are making with people living on the estate. Small boat making and stories We have a massive harbour in our neighbourhood, which we probably all enjoy. 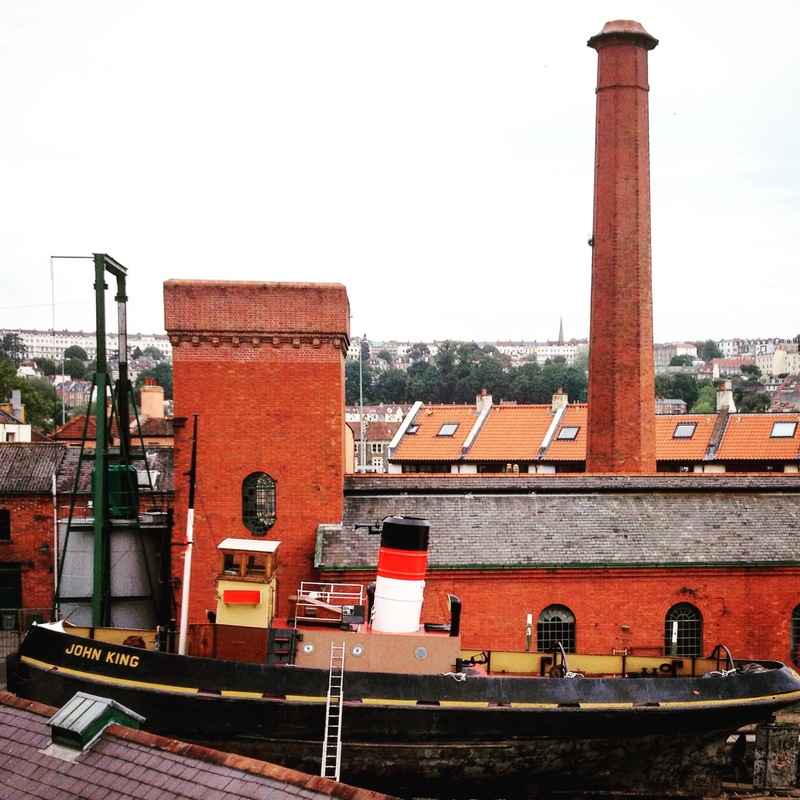 People who live, work on and build boats are brilliant when it comes to making and fixing things and we’d like to share their stories to inspire you. Doors open Day. 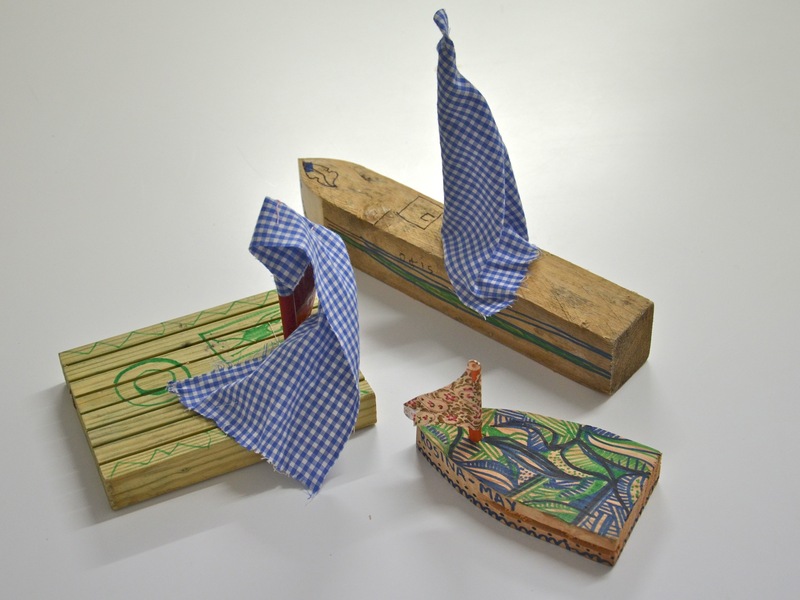 12th September 2-4pm come to the Underfall Boatyard and make small ‘boats’, for a flotilla in late October, out of waste wood and see how the yard re-uses so much waste and find out about it’s amazing transformation. 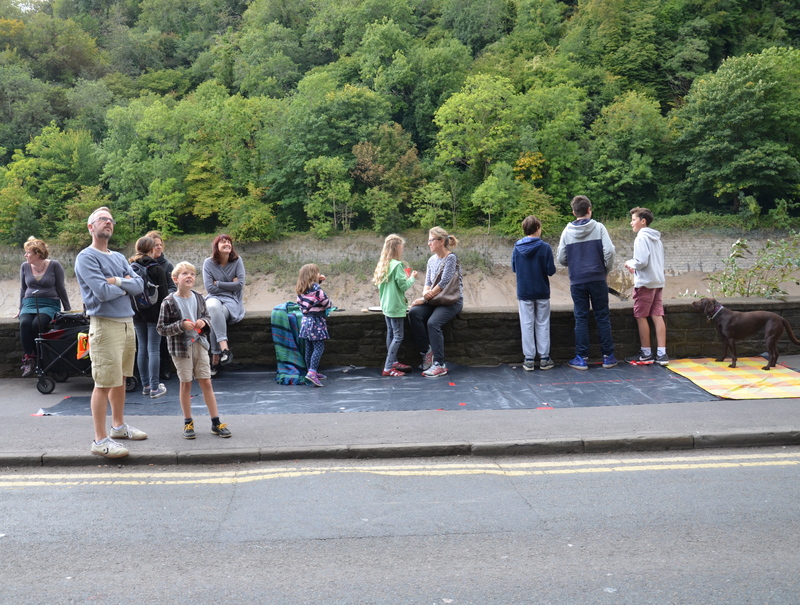 Picnic on the Portway- let’s have afternoon tea 3-5pm at bottom of the Zig Zag- bring cake and a trumpet! 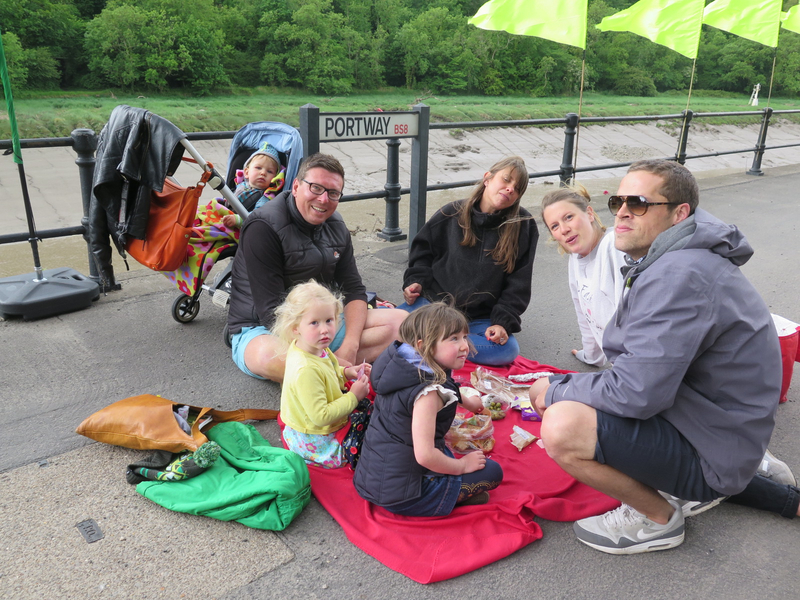 Come and enjoy the car-free Portway with friends and neighbours by bring some tea and cakes and sitting down for a picnic. 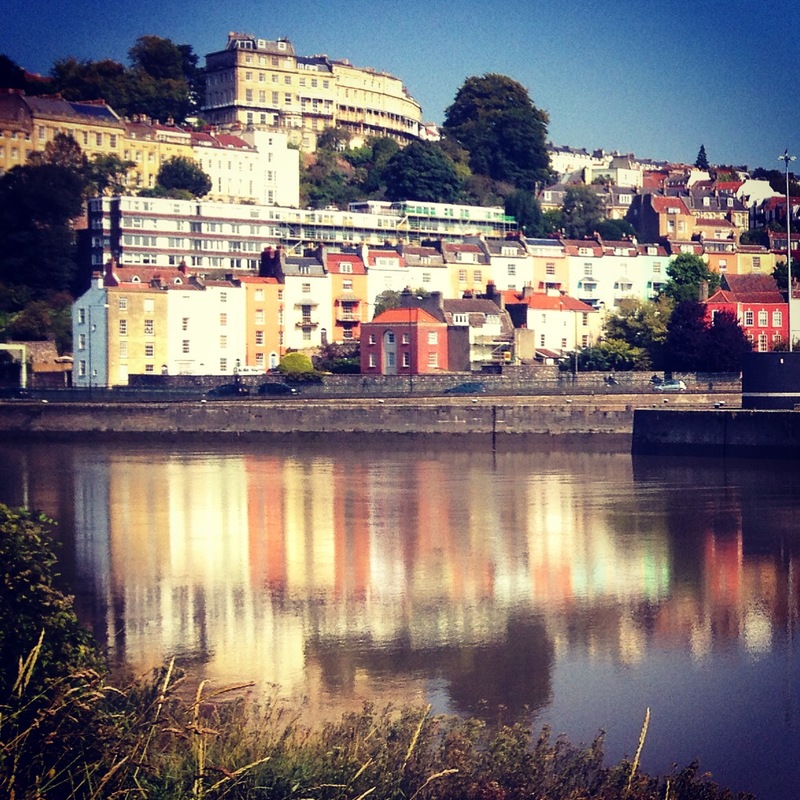 We’re experimenting with the acoustics of the Avon Gorge, so if you play brass or drums, perform poetry, have a megaphone, bring them along! This is part of Build a Bandstand, and is a chance to collaborate and make use of old bits of art materials, theatre waste and those pallets that just keep giving! Working with designers and architects we will create a pre-fab bandstand to bring to the Portway Sunday Park on 25th October. Quick to assemble this will form a stage for performers from many genres. We’ll bring to life old puppets, re-write poetry, music and celebrate improvisation! 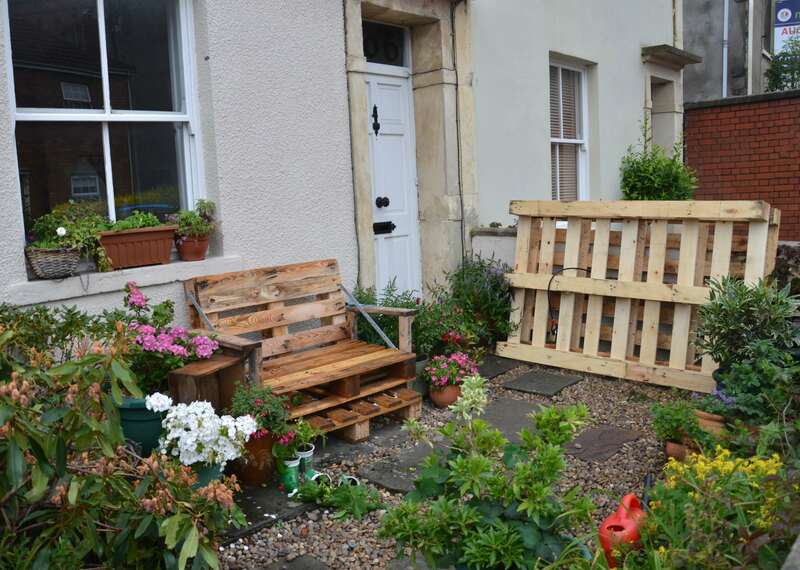 On the 3rd October we are inviting the community to put out unwanted house-hold items for a neighbourhood-wide pavement swap, and show off their planters, benches and bins. 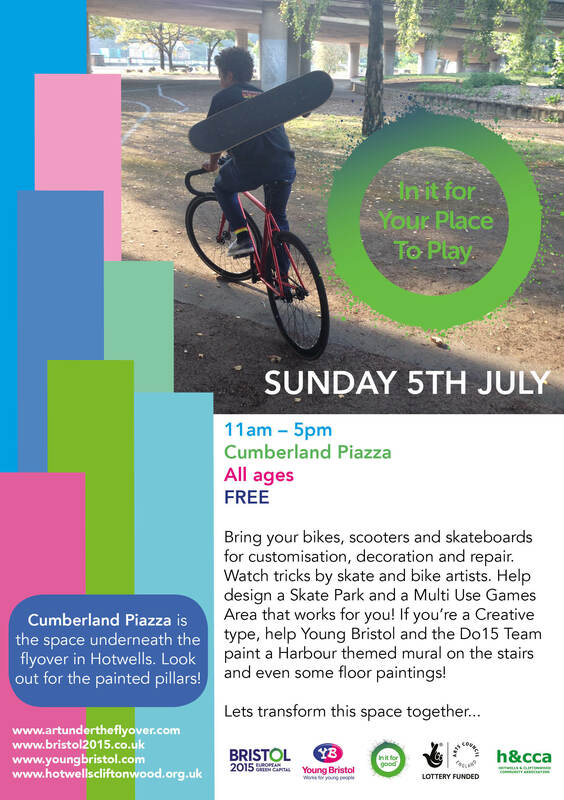 Your Place to Play- Sunday 5th July- activities for kids young and older! 11am-5pm Young Bristol’s amazing Creative Team are coming to paint games on the floor for players young and old to enjoy. They are also planning to paint a local scene on some stairs. If you’re feeling arty, come and join in. 2-4pm Design a Skate Park and Sports Pitch with Canvas Spaces, amazing creators of Skate and other parks. Join in and your contribution to the design may become a reality!